Yves here. I managed to miss this post last week, but since it did not get the notice it deserved, I thought I’d feature it. He told me he subscribes to the view that the world is on the cusp of a major “financial deepening”: As developing economies in the most populous countries mature, they will demand more and increasingly sophisticated financial services, the same way they demand cars for their growing middle classes and information technology for their corporations. If that’s true, then we should want U.S. banks positioned to compete abroad. As anyone one with an operating brain cell realizes, “can contain” is not the same as “have contained” or “have a snowball’s chance in hell of containing”. Simon Johnson was also not happy with the Geithner vision of US financial firms occupying even bigger swathes of the world economy. This post is important because it tackles a very basic question: when does the financial sector become so large as to be unproductive? And the answer is at levels of GDP that the US passed shortly after 1980. Over the last three decades the US financial sector has grown six times faster than nominal GDP. This column argues that there comes a point when the financial sector has a negative effect on growth – that is, when credit to the private sector exceeds 110% of GDP. It shows that, of the advanced countries currently suffering in the fallout of the global crisis were all above this threshold. The idea that a well-working financial system plays an essential role in promoting economic development dates back to Bagehot (1873) and Schumpeter (1911). Empirical evidence on the relationship between finance and growth is more recent. In the early 1990s, economists started working towards identifying a causal link going from finance to growth. 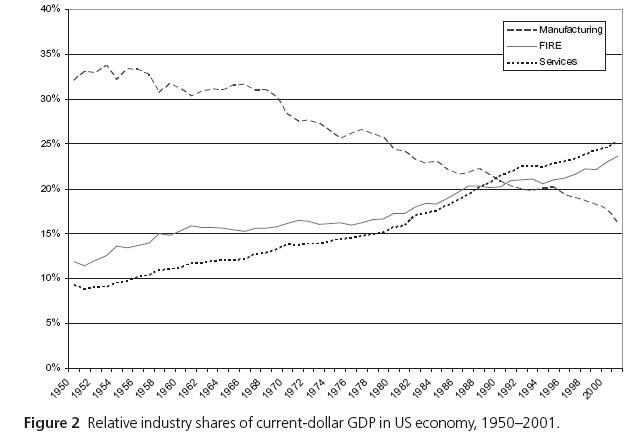 King and Levine (1993) were the first to show that financial development is a predictor of economic growth. More evidence in this direction came from Beck et al. (2000) who used different types of instruments and econometric techniques to identify the presence of a causal relationship going from finance to growth. Finally, Rajan and Zingales (1998) provided additional evidence for a causal link going from financial to economic development by showing that industrial sectors that for technological reasons are more dependent on finance grow relatively more in countries with a larger financial sector. There is by now an enormous literature showing that finance does indeed play a positive role in promoting economic development and few economists now doubt the existence of such a causal link (Levine 2005). The recent crisis has however raised concerns that some countries may have financial systems that are “too large” compared to the size of the domestic economy. Wolf (2009), for instance, noted that over the last three decades the US financial sector grew six times faster than nominal GDP and argued that there is something wrong with a situation in which, “instead of being a servant, finance had become the economy’s master”. For his part, Rodrik (2008) asked whether there is evidence that financial innovation has made our lives measurably and unambiguously better. The idea that there could be a threshold above which financial development hits negative social returns is hardly new. Minsky (1974) and Kindleberger (1978) emphasised the relationship between finance and macroeconomic volatility and wrote extensively about financial instability and financial manias. More recently, in a paper that seemed controversial at the time, and looks prophetic now, Rajan (2005) discussed the dangers of financial development suggesting that the presence of a large and complicated financial system had increased the probability of a “catastrophic meltdown”. In an even more recent paper, Gennaioli et al. (2010) show that, in the presence of some neglected tail risk, financial innovation can increase financial fragility, even in the absence of leverage. Besides increasing volatility, a large financial sector may also lead to a suboptimal allocation of talents. Tobin (1984), for instance, suggested that the social returns of the financial sector are lower than its private returns and worried that a large financial sector may “steal” talent from productive sectors of the economy and therefore be inefficient from society’s point of view (for a more nuanced opinion, see Philippon 2010). In a new paper (Arcand et al. 2011), we contribute to the literature on financial development and economic growth in three distinct ways. First, we build a simple model finding that, even in the presence of credit rationing, the expectation of a bailout may lead to a financial sector that is too large with respect to the social optimum. Second, we use different datasets (both at the country and industry-level) and empirical approaches (including semi-parametric estimations) to show that there can indeed be “too much” finance. Our results show that the marginal effect of financial development on output growth becomes negative when credit to the private sector surpasses 110% of GDP. This result is surprisingly consistent across different types of estimators (simple regressions and semi-parametric estimations) and data (country-level and industry-level). The threshold at which we find that financial development starts having a negative effect on growth is similar to the threshold at which Easterly et al. 2000 find that financial development starts increasing volatility. This finding is consistent with the literature on the relationship between volatility and growth (Ramey and Ramey 1995) and that on the persistence of negative output shocks (Cerra and Saxena 2008). Third, we discuss how our results relate to the current crisis and show that all the advanced economies that are now facing serious problems are located above our “too much” finance threshold. We also run a battery of tests showing that the size of the financial sector played an important role in amplifying the effects of the global recession that followed the collapse of Lehman Brothers in September 2008. While most of the recent discussion on the negative effects of financial development concentrates on the advanced economies, we show that during the recent crisis the amplifying role of the financial sector was also important for developing countries. We believe that our results have potentially important implications for financial regulation. The financial industry has argued that the Basel III capital requirements will have a negative effect on bank profits and lead to a contraction of lending with large negative consequences on future GDP growth (Institute for International Finance 2010). 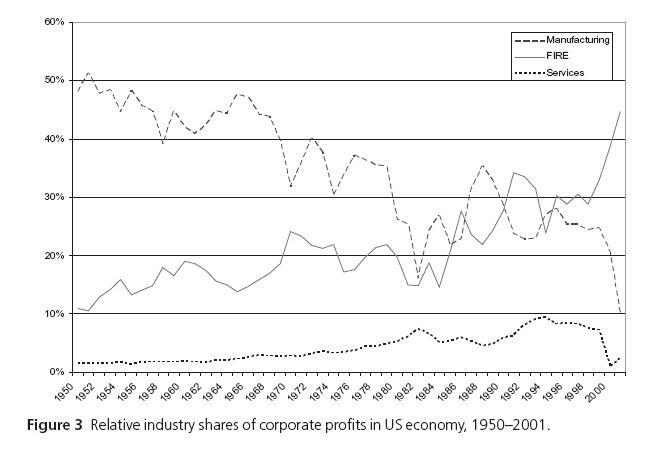 While it is far from certain that higher capital ratios will reduce profitability (Admati et al. 2010), our analysis suggests that there are several countries for which tighter credit standards would actually be desirable. This entry was posted in Banana republic, Banking industry, Credit markets, Economic fundamentals, Guest Post, The dismal science on April 15, 2011 by Yves Smith. This is the central issue of our times. And the financial master distorts incentives and slowly but surely destroys the productive economy. Unfortunately, few get it. There would be some merit to seek a role and growth in emerging markets, but not when you have that elephant trampling the local economy. Negative, the only view Timmy Geithner subscribes to are those force fed to him by Kissinger and Peter G. Peterson. The abridged version: they’ve relocated the product assets offshore; they’ve relocated the capital assets offshore. Accepting that they (have) become too large, I personally find the question why they become so large much more interesting.. But then questions of uneven geographic development and how much growth is sustainable, and how much a place can grow before it’s ‘mature’ and no longer in need of much further investment crop up, and these don’t appear to be very popular with mainstream economists..
You’ll find many wildly varying theories of course. I’m convinced it’s a natural consequence of Fed monetary abuse and moral hazard – all in the name of managing the economy. The only products of a booming financial sector are rent extraction, asset bubbles, unserviceable debts, oligarchy, job loss, and destruction of what’s left of a middle class. In the Nineteenth Century, the public believed JD Rockefeller was evil incarnate. All he did was rationalize the oil business. It is difficult to believe the economics profession has any purpose but perpetuating stupidity and public confusion. Can GDP measure that too? Rockefeller did more than just rationalize. He forced stores to carry his product. If they said no, he would open up a store that carried his product and sold everything at a loss until the other store closed. Than he would jack up the prices. Sort of like Wal-Mart, only now people are too stupid to understand. Give Geithner his position at Goldman already and put Warren in as Treasury Secretary. She deserves some real power. I think Obama has already demonstrated that he’s business friendly. Now let’s try and level the playing field. Has Geithner learned nothing from the financial crisis? St Milton the Friedmanite proved when he slayed the Keynesian dragon with the sword of Rand that all regulations are always bad. Except for the bottom 99% of course, who must be regulated into submission for their own salvation. Mark, Geithner is a true believer. He is a high priest of the Friedmanites. As a true believer, facts are irrelevant. Learning is impossible. Much like the hold Rasputin had over the Romanoffs, Geithner holds Obama in his thrall. He must be removed, not educated. Finance is the economic circulatory system of society, much as government is the central nervous system of society. We used to put up with monarchies, until they became too self absorbed to serve larger social functions and then we had to develop models of government as a public trust. Finance is reaching the same point. It has gone from the efficient allocation of resources to complete rent extraction and gambling. It was one thing when bankers actually issued their own currencies, but since the public has been made fully responsible for maintaining its value, the public should retain profits from its circulation. This doesn’t necessarily mean making it some subservient sector of the government, as that tends to have its own problems, but possibly some semi-separate bottom up public process of local and state banks as the foundation and regional and national banks built up from them. Like democracy, it would devolve power back to where it is most responsive. That’s a silly question. A body’s organs are in proportion to its needs. If they grow out of proportion we call that cancer. A cancer starts as only one or a few bad cells but it is still cancer regardless of its size. So the problem with our current system of finance is not size (though that may be a symptom, such as a large growth is) but inherent dishonesty. And what is that dishonesty? Because of the government enforced monopoly money supply, banks may essentially counterfeit money via “credit creation.” But where does the purchasing power for counterfeit money come from? We know where it comes from. It comes from every money holder including and especially the poor since they are not deemed credit worthy themselves. So what is the fundamental problem? It is a government enforced monopoly money supply for private debts. Jesus gave us the solution in Matthew 22:16-22, separate government and private money supplies. Something tells me that for you, every problem has the same solution. Just how many roots of the present economic evil do you think there are? Do you believe solutions are very often elegant? If you think my only tool is a hammer then let’s discuss the subject of money and see who may be short in the tool department. Cat got your tongue? If you think separate government and private money supplies is not the solution then let’s hear your arguments against it. But I tell you in advance that I’ve debated it thoroughly at several sites and no one can offer but the lamest objections to it. Let’s hear yours. Often overlooked in the debate about the size of the financial system is the distorted incentives built into the workforce. Wall Street has attracted mathematicians, physicists, engineers and others who would otherwise be attracted to jobs in more productive enterprises. The hidden effect is that productive firms in the real economy must pay more to attract individuals with a mathematics and scientific background. 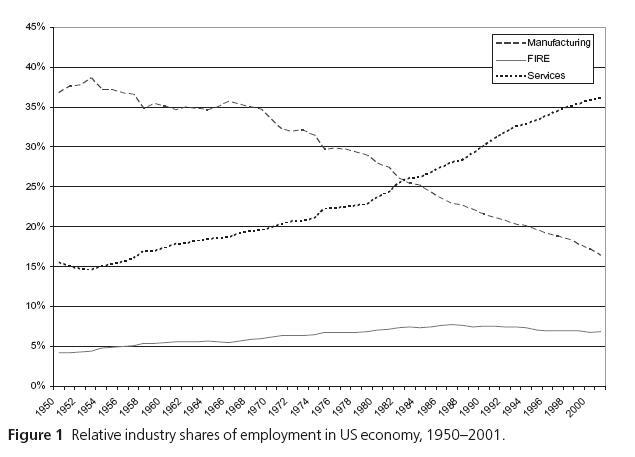 I do not see how an over large financial sector improves the overall competitiveness of the American economy. I am fine with the big banks expanding into the emerging markets. The fastest and most effective way to disembowel our competition is to have these firms set up shop in places like China. One decade, and those countries will be brought to heel with massive financial crises. Beats the heck out of having to invade them with soldiers. Geithner says we can contain the big banks through effective regulation. Just like he did when he was charged with regulating the money center banks as head of the New York Fed, I guess. And let’s not learn anything from Ireland, where bailing out banks whose size dwarf that of Ireland’s economy due to their international expansion has effectively doomed its finances. It’s all Geithner knows, it’s his life, his sacred commitment, his one note, sour, wrong and poorly played. It’s way too bad that a financially ignorant and naive president has a crush on him. Should read separate control of money supply from government and abolish direct private money supply. No. Only the government should have control of its money supply. Who ever else? But that government money should only be legal tender for government debts, taxes and fees, not private ones. As for private debts, let a true free market come up with private money supplies. Money is a contract, not a commodity. There are a whole number of ways people can economically interact. If we accept that government guaranteed currency amounts to a form of public commons, much like a road system, people will very quickly develop all number of mediums of exchange, even just basic social networks. It would create a far healthier society and environment, if we didn’t have to constantly drain all matter of resources out to feed the debt beast. Capital is subject to the laws of supply and demand and it is demand, the amount of viable lending, which determines how much wealth the economy can hold. Above that and you have to lower loan standards. 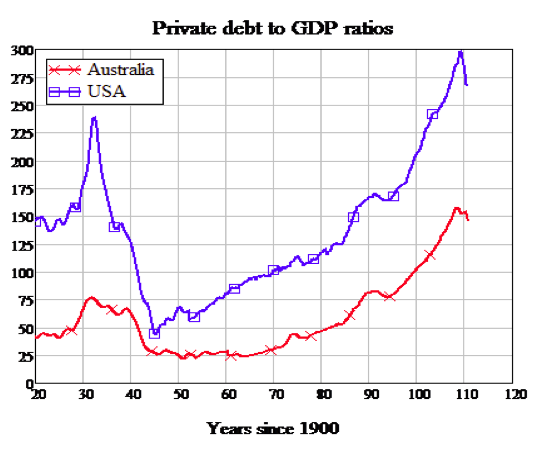 Government debt gets knocked by everyone, but no one makes the point that this public borrowing is the basis of much of what we consider wealth. The joke is on everyone. You confuse “money” with “capital.” Capital is such things as human skill, land, energy resources etc. Money is an intermediary between owners of capital but it is not capital itself. Nor does it need to be lent into existence and certainly not by a third party. Debt is not necessary for money creation. Government fiat can be created debt-free. Common stock is a private money form that requires no debt either. Government should never borrow in the first place. The power to tax in order to pay interest is the power to back debt-free currency. OK, I retract my statement about you confusing money and capital. But my points about lending not being necessary for money stand. But then we wouldn’t have debt slavery. I agree government can lend money into existence, but there needs to be some regulatory function on its ability to do so, or the party will quickly get out of hand. Our current spending function is designed to overspend, because that creates debt. Rather than put together these enormous bills and adding enough extras to get them voted through, we should break them into their various “line items” and have each legislator assign a percentage value to each one. Then reassemble the bill in order of preference and have the president draw the line at what would be funded. Since the constituency for any particular item would not be huge, the tendency to over spend would be limited. A local public banking system, which recycled profits back into local communities, would serve to fund those items currently needing federal grants. Communities with strong business activities would likely generate the income for the necessary infrastructure and those which are more libertarian would presumably rely on more integrated social networks. As long as there is enough prey, the predator population will grow. As long as there is no group that has the requisite power to cull or fence in the predator population, it will continue to grow in power. It will be interesting to see what countervailing forces will arise to challenge the banksters. There are certainly plenty of blogs like this who are attempting to be part of those countervailing forces. But despite however much I appreciate that attempt, I don’t think the power of the pen has much effect on a predator population. Nor on a Tea population. That’s the real problem. “Real” people watch fox. Nothing better to do. No jobs to go to, etc. Sigh. More like, there never really was any fight. There was some yapping and a few harsh words, but the bankers just walked away from it, went back to their predatory business as usual and eventually it dissipated. Nothing to see here, move along. In normal racketeering fashion, the cops are bought and paid for. What can we do? The blogging has at least made me aware of how consistently we are being screwed, and in what manners. How do they screw me, let me count the ways. That helps some. But I don’t find much in the way of workable solutions being offered. If there were practical ideas being formed and organized, the gestapo would probably rain down quickly with their latest big brother tools. I remember when I was young, thinking about the beginnings of WWII and wondering how the average Germans could go along with all the wretched things that evolved. Now I sit here watching similar kinds of devolution all around me and so many people playing along. Indeed there are solutions if one takes an ethical approach to the problems. Our whole money system is fundamentally dishonest. Fractional reserve bankers lend money they don’t have for interest that does not exist. Our government borrows money it could create for itself debt and interest free. There are solutions but if you ignore basic ethics like many liberals do in favor of so-called “fairness”, you won’t see them. a post from 4/12 says Thomas Hoenig is in favor of GSE’ing banks. Kewell. No. You still don’t get it. Government should only spend money into existence and tax it out of existence. Anything more is bound to be fascism. Wrong again. If the private sector is able to escape into private money supplies then government over spending would only hurt government itself and those who received its money. The private sector would even benefit from government overspending since certain taxes would be easier to pay with the cheaper government money. When applying for a mortgage, you must qualify, as financially capable of paying the mortgage by use of calculating the debt ratio. For a long time you could not get a mortgage if you exceeded underwriting guidelines for the DR. If you were spending more than 32% of your income on principal, interest and taxes and insurance, you better have some strong compensating factors and not be more than a couple of points beyond the bright line that required an exception. And you could only get so many of them in the course of a month or year. Of course all of that changed when essentially, any old loan would pass the No Income No Asset criteria of underwriting. Apparently, when no one was looking MMT has prevailed with private debt 300% of GDP and the republicans ready to shut down the Federal Government because public debt is an unsustainable 100% of GDP!! Not only does the Fed make money out of thin air, so does Wall St., and banks, and credit card companies, and ebay turns junk into money, craigslist turns any oriface on your body into an ATM and smart phones make any 17 yr old programmer a merchant swipe processor of a private proprietary digital money. No need for the mint, all of that metal can be sold to China to reduce the trade balance.